I’m not suggesting Emirates should become the national carrier of India. I’m asserting that it is already the de-facto national airline of the sub-continent. And Indians need to tell their politicians to get over the rescue-Air-India-at-any-cost fever, save some tax rupees and let the market decide which airline survives and which doesn’t. As I mentioned in a previous article, Air India contributes 10% of global airline losses with just 0.35% of global traffic (stat. from Bangalore Aviation).To rescue the airline, hundreds of millions of taxpayers’ rupees are required over a long period of time. And even then, a profitable airline cannot be guaranteed, especially one that is mostly run for, and by the government and bureaucrats. Even if you can gloss over the fact that lots of money is required to rescue Air India, the ideas for the turnaround that have been proposed till now have been far from convincing. Repositioning Air India as a low-cost carrier, with sky-high employee-to-plane ratio, aging fleet, poor plane utilization and lethargic execution, is at best an ill-conceived dream. Till date, Air India has filled its planes either with politicians, or by selling dirt-cheap tickets that hardly cover the costs of flying. And these are both unsustainable practices. And with the uphill battle to rescue the airline, I suggest Indians let go and move on. Why Emirates is the de-facto national carrier? 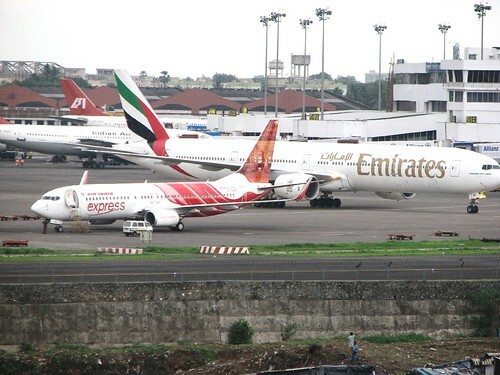 Emirates not only operates many times the frequency to all of Air India’s international destinations, it offers way better service and is already the leading international airline out of India from a number of major cities, ahead of Singapore Airlines, Lufthansa and KLM. For the true aviation geeks among us, let me share some statistics* about Emirates’ operations since they started the daily Dubai-Los Angeles (LAX) and Dubai-San Francisco (SFO) services on May 1, 2009. EK is the leader in market share to MAA/BLR/HYD/COK to/from LAX. Outsold CX, AI, LH, BA and SQ to BOM from LAX. Has # 2 market share on this route behind Korean Air. Ranked #6 in market share on LAX–DEL route behind OZ/LH/CX/SQ/CI. On SFO–BLR sector, ranked #3 in terms of market share; outsold LH and BA on this route even though LH has a daily same plane SFO–FRA–BLR flight operated with a B 744. On SFO–BOM sector, ranked #3 behind CX and KE in terms of market share; outsold SQ/BA/LH/AI. Market share leader on SFO–HYD sector, outsold LH 3:1 and SQ 2:1. On SFO–MAA sector, ranked #3 in terms of market share behind SQ and CX; outsold LH/BA each by 2:1 margin. Imagine what will happen once Emirates starts flying its high-capacity A380s to Indian routes, connecting seamlessly to all over Europe and North America in the next few years. No other airline, even if they’re part of alliances, would come close to beating Emirates in terms of capacity to India. Hence, I rest my case that Emirates is serving the purpose of a national carrier to India. What about the residues from Air India? The Hindus in India submerge the ashes of someone who’s passed away in the Ganges river. Metaphorically speaking, the same should be done with Air India. The Indian government should take a leaf out of the Aussies. When Ansett perished, the good parts were taken up by Qantas and the rest forgotten. Similarly, once Air India stops operations, the planes can be sold to other Indian carriers like Jet Airways and Kingfisher. Most of the additional capacity would certainly be absorbed by the slew of quality LCCs in India, like SpiceJet and Indigo. As for the large number of employees, if they can’t find jobs with local or foreign private airlines, I’m sure the Indian Railways can come to the rescue, which is already the largest employer in the world. And the railways still carry more people per day in India, than the airlines do in a year. Indians should realize that by forcing Air India to stay alive, they’re not helping anyone. Good money is chasing bad money. The politicians are still making merry and the service standards still remain hopeless compared to competition. Great Blog, I agree this is probably the best solution for the Air India problem. Saves the taxpayers money and provides them with a superior service. Daring and directly put. Mocking too badly, but very true. Now you need to do an article on SriLankan Airlines. Is US ie LAX / SFO the only points Indians Fly to ? If you look at the Sixth freedom to points SAO / YYZ / SYD / AKL / HKG / BJS it's the legacy carriers like BA/CX/AF/SQ/KL/LH who rule the roost including 9W & AI . Looks like you are patronising Emirates probably looking for a job I guess. Air India may be a fag airline to many but if you actually look at service they really look after the working class ie no high flying air hostess who thumb their noses because you are not dressed in chinos or drink wine and eat cheese and biscuits after dinner. With our new Indian cabinet in place , probably the first time India has such a young and dynamic team on board they should serioulsy look at a total revamp of the product , ie routes / aircraft / staffing levels rather than chucking off something that has the potential to market and promote India on a global scale. Are you thinking of lending the Maharaja to Emirates and asking their crew to wear tikkas and speak Hindi if that is the case then I guess it's better you stop eating chappati&Dal anbd ask all Indians to buy burgers and coke. Jet Airways and Kingfisher together can be the next in line rather than your stupid option. Well-written piece indeed! However, my opinion is that often we confuse management problems with ownership problems. I too am guilty of this. But these two problems are very different. It's often not the question who owns or runs an entity – public sector or private sector – but how is it managed. In fact, ownership seldom seems to be the problem (except in situations of conflicts of interest). It's almost always the management. So, privatisation or as you suggest complete dismemberment may not be the optimal solutions. NACIL is a big employer. You have suggested selling off planes to private carriers like Jet and Kingfisher. But what about the staff? What happens to the employees? I think that's a big concern. Indian government can't contribute to further misery by dissolving the entity and rendering so many unemployed. Furthermore, given the specialised nature of the industry, it is not easy to re-employ them either. So it's a tough call. Also, public enterprises are not always “for-profit” and they cannot take decisions solely on “profit-loss” grounds unlike the private sector. Well, in India even the Private sector can't do so that easily. As I have said before, it's a management problem which can be resolved through a management restructuring and it has already taken place. India does have some profitable public sector undertakings like ONGC, BHEL and now the Indian Railways (of course, that benefits too because of it being a monopoly but a monopoly is a good solution in that case…it could be a natural one). So public enterprises can be turned around if there is political will and appropriate people at the helm. I know it's painful to travel by Air India and very often the company carries a ruthless air about itself and so do the employees. This certainly has to change. And I think now it will. I strongly disagree with the comment. “Indians need to get over Air India “-As an Indian aviation professional and keen observer of airline business in India and a student of management let me first set the facts straight. Indian travellers or general public are NOT obsessed with Air-India ,it is the politicians with 1. vested interests and 2.vote bank politics (strong and huge unions),who are eager to pump tax payers money to save this national shame. India has its own Airline which are world class-Jet Airways and Kingfisher has been offering high quality service and in some sectors have taken away significant marketshare from airlines like BA.Therefore the Airline which truly represent India should be either of these and not a foreign carrier. If India can send space mission to moon and develop missilies on its own,it doesnot need any foreign carrier to be called national airline. A national airline just does not run for profit. It serves a major infra structure need. If we did not have Air India/Indian Airlines, many of the far flung locations would have no means of effective transportation. HAving said there are no reason why these airlines cannot be run efficiently. we need to move away from the social obligations/union politics and make Air India more effective. get in fresh blood and reduce the waste. That in itself will free up billions of rupeees and providegreater employment. Emirates first interest is Dubai and ofcourse what comes with it. Will they continue in a crisis. I remember the epidemic scare a few years back in Gujarat and all the Gulf carriers refused to fly into India for more than 30 days. And then ofcourse there are Kingfisher and Jet Airways which are among the best in the world. Why when we have the means do we want to give our hard earned moiney to out siders. This is my first blog I am doing in my life. So expert bloggers please bear with me. Let us analyse what Shashank intended to say. If we break it component wise, I think he is talking about NATIONAL CARRIER. So there is a bit of Patriotism in what he says. I definitely feel for the pain for a feeling that our National Carrier is no longer our beloved carrier. Well, you might be wondering as why I am drifting away from Natinal Carrier subject to Patriotism. True, I appreciate the very feeling what shashank has to say, because there is a feeling of TO BE A PROUD INDIAN. But as we globe trotters, while experiencing the service levels offered by other carriers get confronted with a feeling that the overseas carriers render superior, quality service, when compared to the services of our national carriers. Having been a Soldier for 15years in the IAF (Indian Air Force), I have dedicated my youth to this great nation. Hence, as a true soldier, I do very well understand the Patriotic feeling we all possess and express. Now,One needs to know the inside story of Air India, our International Flag Carrier. If you trace back the history it is Air India which has nursed many foreign carriers who are on top rung of the market. So Air India does have that quality people within it, Even you will notice some of the senior level professionals in middle east carriers and south east asian carriers, you will always find ex-Air indians. So, whats killing the Airline? it is partially correct to say that our Delhi-Babus and national nethas are primary cause for this debacle. But, there are no professionals to run this airline. So the government’s policy of A-to-Z of typical SARKAR KA DAFTAR is what is killing the talented young one’s to lead this carrier. This calls for a MAJOR PHASING OUT of not only aircraft, but also the bosses. The management and the government is to be blamed for letting the unions to gain power, for some of the ex-toppers of the airlines who applied the typical civilian politics within the company for their vested interests, definitely with the close support of DB (Dilhi-Babus). Because, the nethas wanted their vote bank to be secured, they used the Carrier to their timely rescue like Evacuating Indians from Kuwait during the the gulf war. Well, we all clapped that AI is doing wonderful job and even proud to say that it had entered the Guinness Book of Records for Highest Civilian Evacuation in Shortest time by an Airline. Well.. When the same Airline posted loss for the funds have not been rendered for this operation, what else can one expect? So like Harsh said, if Air India were to make profit, do you think we could have brought our indian brothers from Kuwait for free? No. If it was priviatised then…well the governement had to cough up the money upfront for this operation. Will KF and JET take up this operation for free like AI did? In short, NO FOREIGN CARRIER CAN BE ACCREDITED OR REGARDED AS INDIAN NATIONAL CARRIER as long it’s objective is to make profit, however effificent they are. (Because, first citizen of our country when flies does not fly KF or JET) Certainly we can regard them best for their services and even admire them for their value for money. Moreover, these airlines being private could well be sold to some foreign carriers as profit is the motive. But, do we sell our NATIONAL CARRIER? or OUR NATIONAL PRIDE……?? No….. it remains with us forever. When we say NATIONAL, this entity is owned by the government of India. Therefore, it’s time for us (govt) to revamp its status to be a PROUD NATIONAL FLAG CARRIER OF INDIA . I can understand the view of Harsh Mohan but have a fundemental issue with the comment: “A national airline just does not run for profit.” Of course it runs for profit, otherwise (provided there are other local carriers available) it should be shut down. All of the advantages that are mentioned in the rest of the post are correct but they arise from a competitive environment, not State handouts. I agree with the next comment about a national infrastructure need, however that need is not necessarily met by a single entity. India, like any nation requires a strong civil aviation industry that can support the national interest in times of crisis. If Air India were the only civil aviation asset then I would agree with the State taking extraordianry measures to support it, however that is not the case. India’s civil aviation sector is growing and apparently strong, Extraordinary measures to support one airline over another defies competitive theory. However, Emirates? Give me a break, nice airline but not India’s national airline! Tend to agree with comments from Stephan but have seen enough of the industry to know that each governement supports their airlines. In USA the CEO has to be an American citizen. The masive loans and guarantees given for US airlines after 9/11 is another example, in case of Boeing the defense contracts and the EXIM bank support supports the commercial aircraft business. same for Airbus industrie. It is same as USA bailing out Frddie Mac, AIG, all the big banks, GM, Crysler, etc etc. It goes on. At the end of the day it is jobs, politics, etc which works. But yes on principles ALL BUSINESS must be runon profit motives else allowed to die. Great article… True revelation for AI. Don’t know how many people are their who feel in the same way!!! Always everything cant be measured & calculated technically..i guess.. The old flag carriers always existed simply to ferry the politicians on their boondoggles. Then the like of Air India (IA too) might as well recoup some of their costs by filling up the airplane. Here in the US, the House and Senate leadership can requisition a USAF Gulfstreams to ‘stand by just in case’ (so now the USAF needs about $550 million more of these types to provide the necessary lift). This makes it difficult for the commercial airlines. If the 10-12 people in the typical Senate/House majority leadership entourage flew commercial (business class ofcourse, as not all of us are equal when it comes to going home after a legisative session), the fortunes of United, AA etc would improve substantially and the country would make a dent in the current deficits. But I predict that there will always be a ‘flag’ carrier everywhere in the world and these will be taxpayer financed. I think it’s important to understand why this situation has risen today. The Government of India’s policy was a one way street that is to allow foreign carriers (and by that I mean all Gulf carriers) to base their India strategies on market demands, but imposed bizarre and mind-boggling restrictions on what Indian carriers could do. Today for an Indian domestic carrier to launch international service they need to complete five years, where as carriers from the Middle East can just buy two planes and start flying to India. This policy is unfair and makes no sense. I've am a supporter of giving free and open access to foreign carriers in the Indian market which should be driven by market demands provided there is fair competition for the Indian carriers to take on the onslaught. If Indian carriers are given a fair chance I am sure we don’t need Emirates to be our national carrier as some of the products and service offered on Indian carriers are far superior if not better then the established legacy carriers. Am with you Shashank. EK has shownn excellent service standards, punctuality and good fares!! And look at their network ! I personally prefer flying EK .